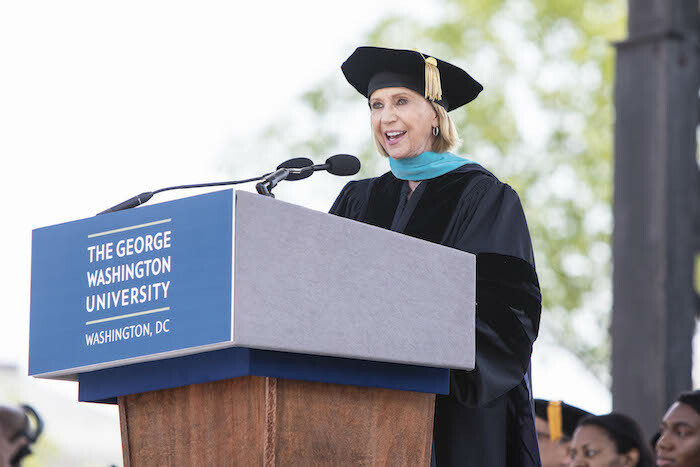 Marcia McNutt, president of the National Academy of Sciences, delivers an address to graduates at the George Washington University's 197th Commencement. WASHINGTON, D.C. (May 20, 2018)—The president of the National Academy of Sciences Marcia McNutt delivered a keynote speech and 6,000 undergraduate and graduate students received degrees Sunday at the George Washington University Commencement on the National Mall. With the U.S. Capitol providing a backdrop, more than 26,000 people attended the ceremony. GW is the only university that holds its graduation ceremony on the Mall. GW President Thomas LeBlanc, celebrating commencement for the first time as the university’s president, opened his remarks by savoring the moment and taking a selfie from the stage with graduates and the Washington Monument in the background. “The moral is: Hope is contagious. And it’s a good kind of contagion,” McNutt said. LeBlanc conferred honorary degrees to McNutt, Olympic bobsled medalist and GW alumna Elana Meyers Taylor, and Steven Knapp, president emeritus of GW. In her remarks, Meyers Taylor recalled the “bad day” she had at softball tryouts for the 2008 Olympic team. After she didn’t make the cut, her mother suggested she try out for bobsled, and Meyers Taylor continued to pursue her Olympic dreams. She urged graduates to keep dreaming, too. She described how she stared through the fence and across the lawn toward the White House and announced to her parents that she would someday be president. A decade later, she walked through the fence to the White House as an intern, joined by her parents. “If there is one thing I have learned during my time at GW, it is that each of us has the power to cross those fences, walk across lawns and open doors that we never even dreamed we could,” Mathews said. Following university tradition, LeBlanc offered a charge to the graduates. With the addition of today’s graduates, there are now more than 290,000 GW alumni living in more than 150 countries.